Is your wedding day approaching? Is it time to select the rings that you and your spouse will wear forever? If the answer is yes then you have come to the right place. 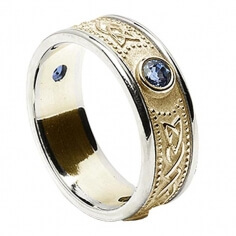 A Celtic wedding band is a beautiful way to celebrate both your love and heritage. 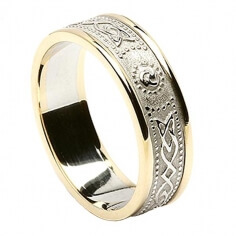 Only here at Celtic-WeddingRings.com are you offered such an extensive range of exquisite women's and men's Irish wedding rings inspired by the unrivalled designs of the ancient Irish and Celtic cultures. 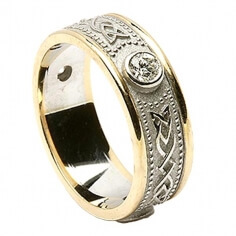 This beautiful Celtic weave wedding ring is suitable for both women and men and is available in Sterling silver, 10k and 14k white or yellow gold. 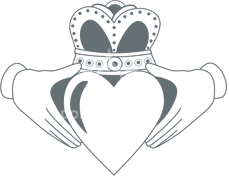 Of course, your ring will also be hallmarked for quality by the Dublin Assay Office. For the beautiful Celtic weave ring with trim, our craftsmen have enhanced the elegant gold band with a contrasting gold trim on each side. Or if you prefer, the ring is available in all yellow or white gold. 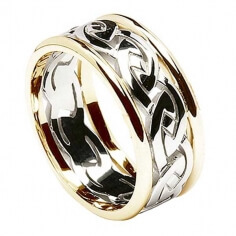 This beautiful Celtic wedding ring is available in silver, yellow or white gold and features a highly polished Celtic knot design, set on a contrasting matt-finish band. The overall effect is striking and the endless Celtic knot can symbolize the love between a couple. This Celtic wedding band has the beautiful center Celtic knot design crafted in silver or gold and then set on each side with a gold trim. 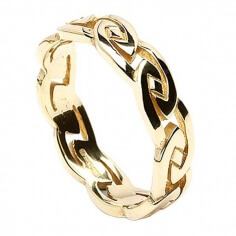 The Celtic spiral knot is traditionally associated with endless love. Look inside the band and you will see the hallmark of the Dublin Assay Office. Sleek and elegant is the best way to describe this Trinity knot wedding band, which is a new addition to our collection. It features continuous Trinity knots around the band and is available in white or yellow gold. This Trinity knot wedding band has a gold rim on either side, the band in the center has several carved Trinity knot designs. This is a new addition to our range. Introducing the stunning Trinity knot ring with diamonds. Continuous Trinity knot designs are carved out of the center band, between each knot sits a single diamond. Introducing the Trinity ring with emeralds and diamonds. Continuous Trinity knot designs are carved out of the center white gold band, separated by emeralds and diamonds. Introducing the Trinity ring with rubies and diamonds. The Trinity knot designs are carved out of the center white gold band, giving the ring depth. 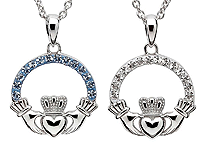 Each design is separated by rubies and diamonds. 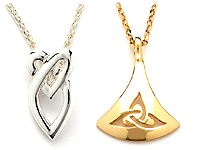 The Trinity knot designs are carved out of the center white gold band, framing each design. Each Trinity knot is separated by sapphires and diamonds. On both sides of the center band are white gold rails filled with sapphires and sparkling diamonds. Continuous Trinity knot designs are etched into the band. This beautiful wedding band is available in silver, gold and white gold. 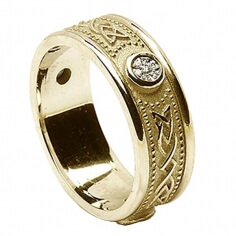 A series of Trinity knot designs are etched into the center gold band, the ring is finished of with a gold rim on either side. You can choose contrasting gold types to create a two tone ring or go for the more solid all white or all yellow gold band. The Eternal Celtic knot ring consists of an infinite Celtic knot design, representing eternal love. Carefully crafted by hand, then tested and hallmarked by the Dublin Assay Office. The eternal Celtic knot ring with trim is a standout piece of jewelry. An infinite Celtic knot design enclosed by two contrasting rims. Or you can choose the same coloured rims for that single tone look. The eye-catching Eternal Celtic knot ring with diamond trim is a joy to behold. 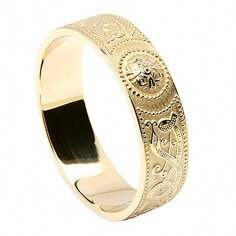 A thick Celtic knot design runs continuously forming the central gold band. Simple, but elegant, the Infinity knot ring represents togetherness in the true style of the endless Celtic-styled infinity knot. 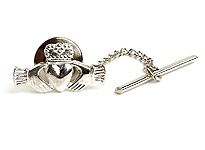 Handcrafted to order by Irish artisans, then sent to the Dublin Assays Office where it is tested and hallmarked. The Infinity knot ring with trim is an ideal Celtic wedding ring. 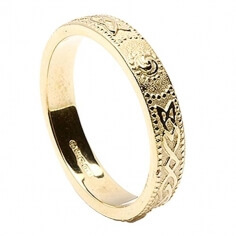 It features the classic endless Celtic infinity knot in gold, with the choice of an elegant trim on each side in a variety of options to suit your taste. This simple but elegant eternity knot wedding ring features two intertwining woven lines which symbolize the intertwining forces of existence and eternal love. 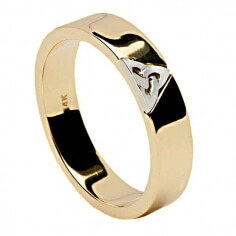 This two toned Trinity wedding ring is an excellent symbol for any soon to be married couple. The trinity symbol is engraved into the band. This symbol has many meanings such as eternity and spiritual growth. The two-toned Celtic knot wedding band is a very popular choice. It may have a lot to do with its simplistic yet elegant style. This ring is available for men and women. It is not overtly flashy, but it still possesses a lot of meaning. 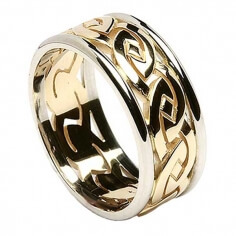 This is one of our most beautiful Celtic wedding rings, it features a polished Lovers knot design set against a contrasting matt finish background. You can choose from silver or yellow gold, in 10k. Handcrafted in Ireland by experienced artisans, the Irish knot ring displays a modern take on Irish rope knot design which is engraved around the entire band. The endless knot signifies the cycle of life and eternal love. The 14K white gold women's Sapphire Shield Ring with Diamond Trim is set with three sapphires in a white gold band. It is finished off with diamond filled white gold rails on each side. The 14K two-tone gold women's Ruby Shield Ring with Diamond Trim is set with three rubies in a gold band. It is finished off with diamond filled white gold rails on either side. 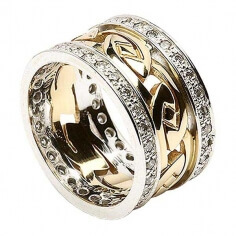 The 14K two-tone gold women's Celtic Shield Ring with Diamond Trim comprises of a gold band with intricate detail and is finished off with diamond filled rails on each side. Introducing the 14K white gold women's Celtic Shield Ring with Sapphires. The D shaped white gold band is set with three sapphires and yellow gold light rims on either side. 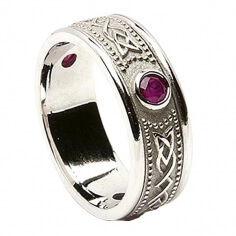 Introducing the 14K white gold women's Celtic Shield Ring with Ruby. The D shaped band is set with three rubies and light rims on either side. For this version of the beautiful Celtic diamond ring with trim, our craftsmen have enhanced the gold band with a sparkling diamond and then set it between two gold trims for a stunning look. This is a very special Celtic wedding ring featuring a Celtic warrior shield design carefully fashioned by our craftsmen and set with a single sparkling diamond. Choose from rich yellow gold or cool white gold. This Irish wedding ring was inspired by the Celtic shield found on the Ardagh Chalice. This is a great choice for anyone who wants to share thier Irish heritage with the world. This beautiful wedding band is handcrafted to order. It is also made with a "comfort fit" design, so it should feel good all the time. The warrior shield design on this narrow Irish wedding ring was inspired by the Ardagh Chalice. The famous chalice was rediscovered in 1868 and has been an important part of Irish culture ever since. It is believed it was used by the Irish during the twelfth century. We have used these very same designs to craft this modern women's wedding ring. This narrow Irish wedding ring with trim was designed from the artwork found on the intricate Ardagh Chalice. The Irish warrior shield was discovered engraved on the chalice in 1868 and is believed to date back to the twelfth century. This narrow wedding ring is a very tasteful choice for anyone interested in Irish culture. The men's Irish wedding ring with trim is handmade by skilled Irish artisans. The inspiration was taken from the stunning Ardagh Chalice with the warrior shield engraved into the band. The Sterling silver Irish wedding ring is inspired by the Celtic shield design found on the beautiful Ardagh Chalice. Intricate in detail and filled with historical significance, this women's wedding band is handcrafted to order. This men's silver Irish wedding ring takes its inspiration from the intricate Celtic shield designs found on the Ardagh Chalice. A wonderful way to celebrate your Celtic heritage with a unique wedding band. The Celtic shield design on this narrow silver wedding ring was inspired by the Ardagh Chalice. This narrow band is great for anyone with Irish heritage or a fondness for Irish culture. The narrow wedding ring with trim consists of a white gold band with the intricate detailing of the Celtic Shield design, as inspired by the Ardagh Chalice. The band has two gold rails on either side, giving it a two tone look. 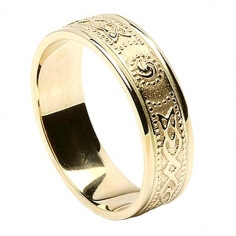 Available in 10k or 14k gold, the center band has the Celtic shield design engraved onto it, then gold rails have been added to each side of the ring to give it a more solid feel. Introducing the women's white gold Shield Ring with Ruby. 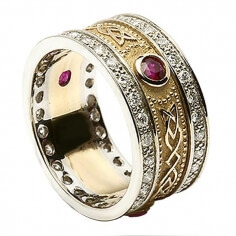 The D shaped band is set with three rubies and light rims on either side. The yellow and white of this two tone ring is beautifully offset with the deep red rubies, set in to the white gold band. The band is filled with intricate Celtic designs that were found on the ancient Ardagh Chalice. 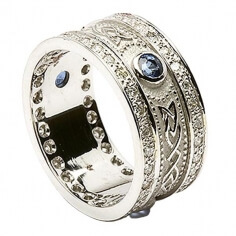 Three stunning light blue sapphires sit in luxurious white gold that is filled with intricate Celtic knot work. The detailing is of the highest quality as the ring is handmade by experienced, skilled Irish artisans. The white gold band is decorated with intricate Celtic knotwork, based on designs found on the Ardagh Chalice, and then punctuated with three dazzling sapphires. It is finished off with two gold rails, providing the classic two tone look. The embossed Celtic knot work on the women's Celtic diamond gold wedding ring is finished with a high polish. This contrasts well with the brushed background. The Celtic designed were inspired by the Ardagh Chalice, an Irish national treasure. Available as a matching wedding ring set, the Narrow white gold ring with trim is a perfect choice for those couples wishing to celebrate thier heritage. The rings have Celtic designs that were inspired by the Ardagh Chalice. 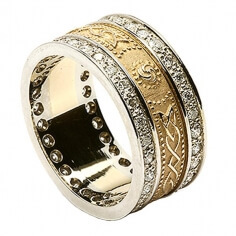 A cool white gold band with intricate Celtic designs and two yellow gold rims form the basis for the two tone shield ring. Three sparkling diamonds are set between the design for additional sparkle. Three sparkling diamonds set this women's white gold shield ring alight. 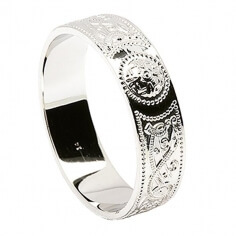 The central white gold band is filled with intricate Celtic knot designs and a rim on either side of the band, also in white gold. Carefully crafted from rich yellow gold, the women's Celtic shield ring with diamonds is filled with heritage and meaning. 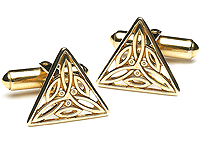 The Celtic knot designs originate from the famous Ardagh Chalice, an Irish national treasure. Introducing the women's Celtic Shield Ring with Trim, a wonderful example of a two tone wedding ring. 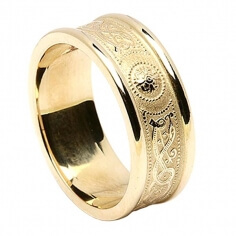 A white band is covered in Celtic knot designs, inspired by the Ardagh Chalice, and finished off with a yellow gold rim on both sides. 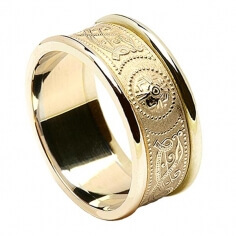 Exquisite and intricate details are the highlight of the men's Celtic Shield Ring with Trim. 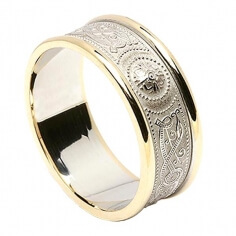 The white gold band is covered with Celtic knot designs that were inspired by the Ardagh Chalice. Bright yellow gold rims are on either side of the band to give it that two tone look. Introducing the white gold Celtic Shield Ring. Handcrafted in Ireland by skilled Irish artisans, the Celtic knot designs used in this ring were inspired by similar designs found on the famous Ardagh Chalice. The men's Celtic Shield Ring is crafted from white gold with intricate Celtic designs. A brushed background sets the tone for the highly polished embossed designs. Inspired by the famous Ardagh Chalice, these wedding bands celebrate your heritage. The deep rich yellow gold of the women's Celtic Shield Ring with Trim is doubled down with the use of gold rims. A bold ring with a brushed finish in the background but a highly polished finish on the Celtic knot work. The men's gold Shield Ring with Trim is available in both 10k or 14k yellow gold. 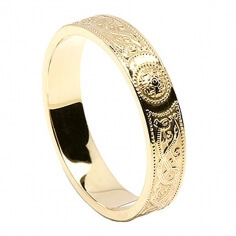 The design on the central band was inspired by the artistic designs found on the famous Ardagh Chalice. The silver eternal knot ring comes in matching set for him and her. Also often used as a wedding band, the eternal Celtic knot represents eternal love together. A solid ring that screams heritage. The eternal knot ring with gold trim is available in either all gold or silver with gold trim. 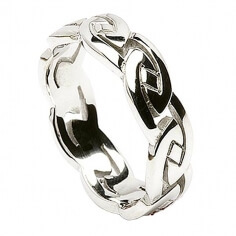 Often used as a wedding band, the Celtic eternal knot represents eternal love. Matching his and hers rings available. Many of the beautiful designs on each Celtic wedding band are symbols of love, honesty and family. 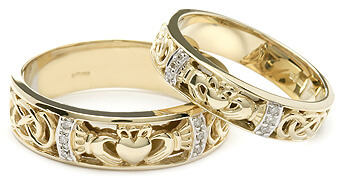 The Irish wedding ring of your choice is available in gold, white gold and some are even offered in Sterling silver. Whichever metal or finish you choose, your Celtic wedding ring will carry the Dublin Assay Office hallmark, as a sign of the high quality of the materials used. From the Trinity Knot to the Newgrange Spirals, our collection depicts fine Irish art and history at its best. For centuries, Irish artisans have been perfecting their methods to design highly decorative, intricate jewelry pieces that capture the imagination. We hope you enjoy viewing our extensive collection of Celtic wedding rings; we've certainly enjoyed crafting them. The Trinity Knot, a traditional Celtic wedding band. The meaning of the Trinity Knot is ambiguous. 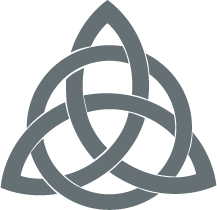 It is believed that Christians view the three cornered knot as a representation of the Holy Trinity. Each corner of the knot standing for the Father, the Son and the Holy Spirit. Another, more basic belief is that the Trinity Knot stands for air, water and earth. Perhaps the Trinity Knot is expressing the cycle of life; birth, death and rebirth. 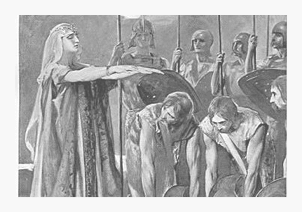 Or even the Gods and Goddesses of Celtic lore. Whichever meaning you embrace, the Trinity Knot is a beautiful addition to your Celtic wedding band. Trinity Knot wedding rings, bearing this meaningful symbol, are available in gold, white gold and silver. 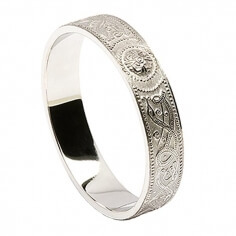 There are solid and filigree styles suitable for both men and women. Is your betrothed truly your soul mate? 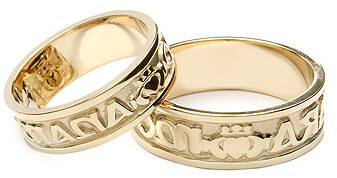 If so you might choose one of the Celtic wedding rings bearing the words Anam Cara. Although the meaning of this phrase is not an exact translation to the English use of the phrase soul mate, it is meaningful. Anam Cara translates as friend of my soul. What a lovely thought to present to your spouse as you exchange your wedding vows. A quick glance at your finger will be a daily reminder of the feelings you shared on your wedding day. The Irish wedding rings crafted by our jewelers often have Celtic or Gaelic names. The beautiful Deirdre ring is a diamond accented band with the Celtic spiral design displayed in the center of the band. Deirdre is a stunning ring and the name refers to the woman who was the most beautiful woman in all of Ireland. Deirdre was engaged to one man but in love with another. There is a gentleman’s version of this ring available, the Dalaigh. 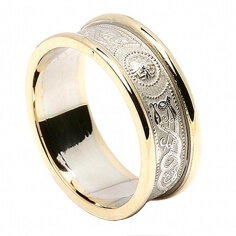 Most of the Irish wedding bands you will find at Celtic-WeddingRings.com have complementary styles of rings for both men and women. 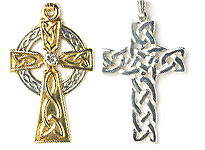 Celtic-WeddingRings.com has a wide assortment of faith rings. Many of these rings consist of some of the traditional Irish symbols as well as the Ogham alphabet. Faith rings are perfect as a wedding band for both men and women. They are commonly used to express commitment to another. Faith rings are not solely for wedding ceremonies. They can be a sign of faith in your love and relationship and are sometimes given as a commitment ring. 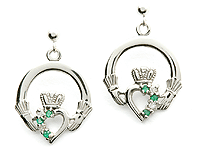 The Claddagh is a well-known example of an Irish faith ring. 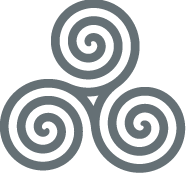 The Celtic triple spiral, found at the ancient temple, or passage tomb of Newgrange is another well-known ancient symbol. Although the symbolism is not fully known, there is much speculation about the meaning of this Celtic glyph that is believed to be more than 5,000 years old. Like many things Celtic there seems to be some belief in the symbolism of three. The trinity, the three realms and even the three trimesters of pregnancy are possible explanations for the design. 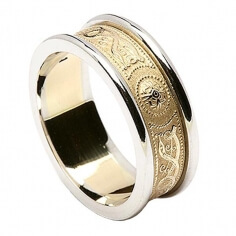 The Cael Newgrange wedding ring is emblazoned with the lovely triple spiral. For a unique lookthis ring is available with an oxidized silver finish or the more usual gold or white gold. 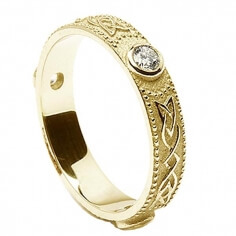 Every beautiful Celtic wedding band you see at Celtic-WeddingRings.com has been handcrafted in Ireland. Knowing that your ring was designed and crafted in the beautiful Irish countryside adds to the sentimental meaning of wearing a Celtic wedding band. The designs are a mixture of the traditional symbols of the Celtic culture and the modern look that so many are looking for. While many of the Celtic symbols are ancient our craftsmen have found a way to give a touch of modern to some of the styles. So if your style leans to the old or the new, there is a Celtic wedding ring that is perfect for you. If not, then we also have a great selection of Celtic shield rings and the beautiful Claddagh wedding rings to choose from.